My paintings reflect my lifelong work with diamonds. We are like diamonds - brilliant, radiant, luminous, full of potential and much more! This is the connection I want to express through my paintings. Each painting, even when inspired by particular shape and color, has my creative imagination making it unique and coveted. My education and career as an artist, jewelry designer and a technical drawing professor helps me tremendously. I start with a blank canvas. I meticulously plot and hand sketch an under-drawing that is precise and will guide my decision on facets and colors. I love this poetry in geometry. Interpreting them into ultra-magnified facets resulting in canvases, some over 6 Feet! I develop my own color palette. Just like life, diamonds would be boring if they were just monochromatic. 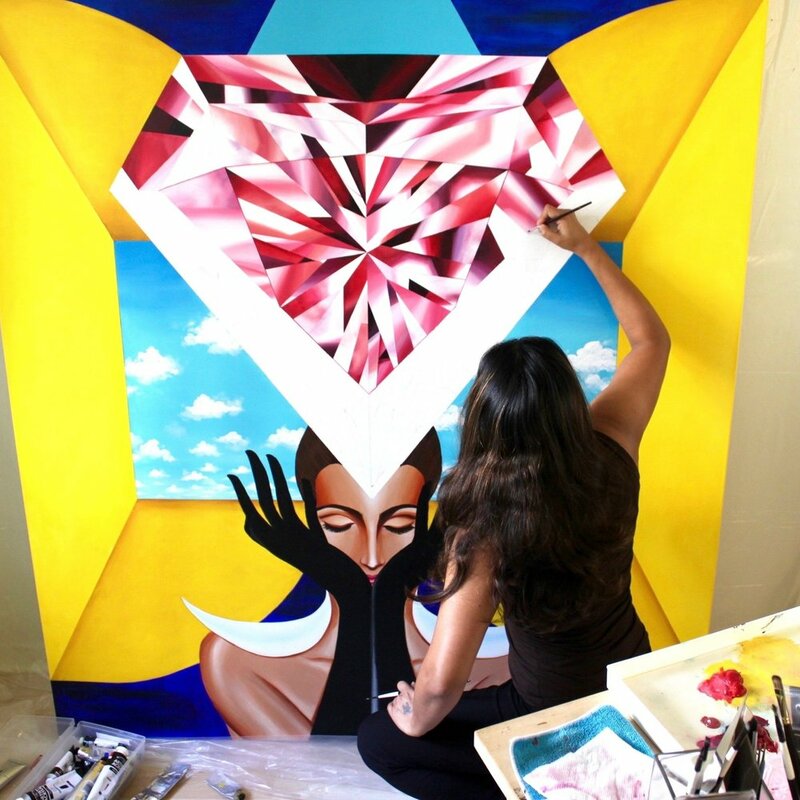 This is why my paintings are informed by the intimacy of a color palette that captures the true brilliance, reflections and colors of the diamond. Each facet is a rewarding result of multiple applications of my color palette layer-by-layer. Each painting is my labor of love. Painting facets takes a lot of patience, deep concentration and judgement. I love being in that magic space! I can spend hours painting and blending each facet. Often, I lose track of time as I paint, intimately capturing the play of light and color. Please click here if you are interested in purchasing a painting from Reena's portfolio or commissioning a custom painting.